Right on schedule, T-Mobile’s Windows 10 lineup has grown with the launch of the Idol 4S with Windows 10. 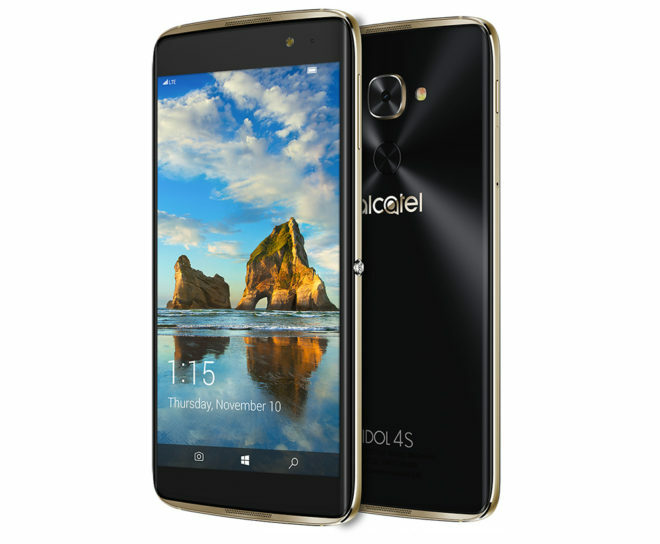 You can now buy the Alcatel Idol 4S with Windows 10 from T-Mobile at a price of $0 down and 24 monthly payments of $19.59 each. Full retail pricing is $469.99. The Idol 4S with Windows 10 comes with a virtual reality headset along with some preloaded games and videos to use with your new VR goggles. Also included with the Idol 4S with Windows 10 is a free 45-day Hulu trial, a 60-day Groove Music trail, and a free copy of the Halo: Spartan Assault game. Alcatel has packed some high-end specs into the Idol 4S with Windows 10, including a Snapdragon 820 processor, 4GB of RAM, and a 21-megapixel camera. There’s also a 5.5-inch 1920×1080 AMOLED display on its face with dual front speakers, a fingerprint reader below its rear camera, and 64GB of storage with a microSD slot for adding even more storage if you’d like. We don’t see a ton of new Windows 10 smartphones lately, and so the launch of the Idol 4S with Windows 10 is a welcome sight. Windows-powered smartphones may not be for everyone, but there are still some folks that like ‘em, and so it’s good that T-Mo is offering Windows 10 hardware. To see the Idol 4S with Windows 10 in action, you can check out an unboxing of the device above. I am still trying to figure out whether to buy one and go on postpaid via zero down for all or buy one off a third party vendor like eBay for a lower price. I’m going to wait a couple of months and see what I can find on eBay as far as this device goes. But then again, I’m planning on stopping by a T-Mo store this weekend to check the device out. I may not want to wait a couple of months! I’d love to play with it. I hate that Windows is going down the drain. With the new Surface Products, Windows is doing anything but going down the drain. It will do nothing but advance the Mobile wing of the platform. Will it be as popular as Android or ios? Never. That ship has sailed. But despite what the “internet experts” keep saying…It’s not going away anytime soon. I’d like to hope you’re right, but with developers dropping the platform all together I don’t think so. Windows isn’t going down the drain. It has far higher market share than Mac or Chromebook. True, the market share for Windows 10 Mobile isn’t nearly as high as it should be, but hopefully we’ll see a resurgence with Windows Holographic, Xbox One, future IoT devices, Windows on ARM, and other devices running the platform on the way, which in turn could lead to more market share for Windows 10 Mobile as well. Time will tell. will continue to play with and maybe my new daily driver. You know I wanted to, but I got an S7 Edge for less money. Couldn’t pass it up. I would like to use a windows phone but i will wait util all the bugs are workout,see if the price comes down,not sure if Tmo,is not pushing to get more windows phones,or if Nokia is by passing them for the other carriers or not,having been on the other 3 carriers sites for a while. Does HTC,still make M10 as a window phone anyone knows? Got to check one out yesterday. Gorgeous device. Will definitely be buying one in the near future. I had an s7 edge. Felt forced to pick it up after the note 7 fiasco. Got mine yesterday morning and after playing with it for 2 days, I’m enjoying it heavily. Yes some of the apps I use on android are not here, but there are others that do the same thing. No dedicated YouTube or vudu apps, but the web browser streams them fine. Also no chrome browser, so I’m researching for a new browser. Microsoft edge on here is not to bad. Other than that, this phone is fast and I haven’t noticed to many glitches. Saw a few the first day but those kinks were worked out as everything has been smooth sailing today. how long before it is discounted? Windows phone is still missing on major applications and lack of support from mobile application development companies and this might lead to another failure to Microsoft. Besides Snapchat and some banking apps, what apps is Windows 10 Mobile missing?